"Good smell, and no residue." Gets the stank out. Good smell, and no residue. "Great job at cleaning them and leaving them without that strong smell some shampoos have." I have been using this shampoo for little over a year. Love it. Will not lather up like most shampoos, but will do a great job at cleaning them and leaving them without that strong smell some shampoos have. "Left dog clean and does not have perfume smell." GSP and Bluetick coonhound. Family pet. "Does not irritate my dogs skin, and works great." Does not irritate my dogs skin, and works great. Great product. Leaves my dog with a nice soft coat. Not to mention smells great too. German Shepard Dog. Family pet. Great shampoo. No more dry skin. He smells great too. Only shampoo that leaves my labs coat just as shiny after the bath as before. I've tried oatmeal shampoos and some top end special order shampoos, and she always had dandruff afterwards for a day or two. Since switching to mud river over a year ago she hasn't had dandruff at all. I've recommended this product to 5 of my fellow lab owners, and they love it just as much as I do. With the silver odor technology I can take my dog swimming 3-4 times before she gets that wet dog smell that stays even after she is dry. Love this shampoo. Takes out the oil and the field and leaves her soft with virtually no scent. Not a perfumy clean, but a pleasing clean. "Seems pretty gentle on the skin"
Black Lab,Bloodhound. Hunts. Family pet. Lab Puppy didn't mind it at all, and it seems pretty gentle on the skin. Just wish it came in a bigger bottle. Good shampoo. Lathers pretty well and rinses easily. After a long, busy day in the field, nothing rewards your dog's efforts like a nice, warm bath. 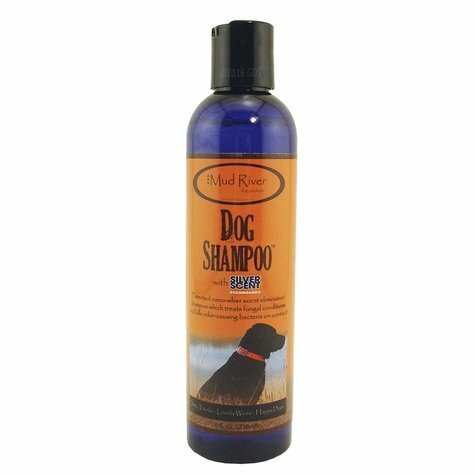 Mud River Dog Shampoo with Silver Scent Technology cleans and conditions the coat and contains an active ingredient known to treat ringworm, dermatitis, hotspots, psoriasis, and eczema. Mud River Dog Shampoo does not over-lather, making rinsing easier.